Eileithyia, on the CTC forum is a great inspiration to me. She highlighted, the AAA Audax Challenge, as she tries to ride an Audax each month of the year, although most of her rides are the 200km ones.... Far too adventurous for myself. I cannot push my tourer bike fast enough to do a 200km in the time allowed, and besides, I am totally wiped out after 100km so for now will stick at that distance. The AAA Audax Challenge is of interest to me because I can include these 100km Audax rides, but the difference is that for this Challenge, the rides must be awarded AAA points, which are only given out to rides with sufficient climbing. Each 1000m being awarded points. I think that its only rides of 1600m or more that are included in this, but please correct me if I'm wrong here. I am not sure, if this Challenge is a new one or not, but certainly this page caught my eye. I have been learning a lot about Audax riding, again, something I found out about from the same CTC forum. Audax riding, is about setting yourself personal challenges to cycle – none of the rides are races, although you do have to complete a ride within a time parameter – the 100km rides are fairly generous with their time, allowing many rides to be completed with an average speed of 10kph. I first started cycling 2.5 years ago, the simple commute ride to work was so exhausting, I saw stars once I arrived after the 4 miles that I was cycling twice a day to and fro. And it was a further 6 months before I was able to cycle to work without walking up all the hills. So I have come a long way in this time, slowing increasing my fitness levels. Living on an island, with no Audax ride was again, something to address. I love Audax in the UK, but living where I do, these rides tend to become expensive due to ferry costs and B&B expenses – I tend to make a weekend of it, taking the Monday off work as holiday, so a bit of organising has to happen to ride an Audax. I contacted Audax UK (I was already a member) and Julian Dyson became my mentor and helped me though the process of sorting out a route – I must of ridden that route 100 times by now, I had to ride it, write out the junctions and signposts, together with the km between turns. Its not that easy imagining someone who does not know the roads and of course living here, I know them rather well. Anyway, Julian visited the island last March and we cycled the route together, over the summer I tweaked the route map many times until it was finished to my expectations and sent it off for verification. 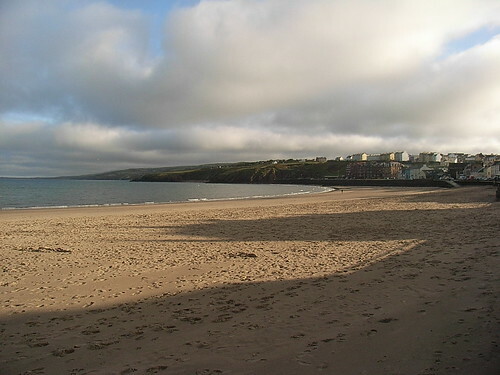 It was accepted, and so a route has been established right here on the Isle of Man. Its called 'Celts, Trams and Castles' – I named it thus, to use the same letters as the CTC as it was CTC forum members who pointed me into the direction of Audax UK. The ride has 1650m of climbing in it, and in December, I posted Steve Snook the route and hey presto, the route has now been awarded AAA points of 1.75. According the Audax UK, I am able to use perm rides to count towards this Challenge, and so it has been set. I rode my Celts Trams and Castle ride on Boxing day, and that will count towards my first month. Today, I repeated this ride. 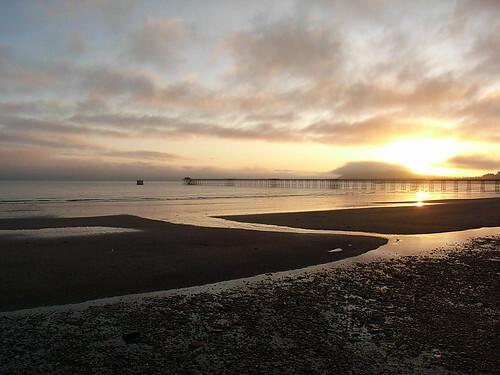 This picture was taken at dawn in Ramsey, with the sun reaching upwards behind the iron Pier. It was a fabulous day to cycle, amazingly no dawn chorus from the birds who are not ready for spring just yet, although I did pass some new lambs! The ride out today very nearly did not happen! All that snow, one of the main routes of my ride takes the cyclist over the Sloc road, this crosses South Barrule (height of 313m) and since the snow the road has been closed. It only opened earlier this week. As the snow had melted flooding had occurred an in many places there is road damage, and rocks, sediment and peat stewn across my path – didn't meet a single car on it though! Weather this morning was perfect, as I didn't want to take all day to do this ride, I borrowed a car and took bike to the start, and set off at 6.15am. I completed the ride by 2pm. 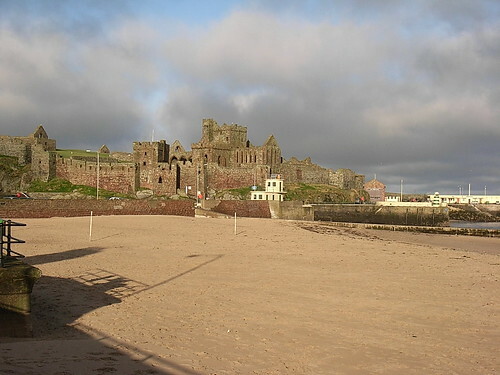 Here is a picture taken on my ride today at Peel Castle, remember there are HILLS on this ride, today, I just thought perhaps some pictures of the flat calm day, taken on the flat! Its odd, how a small island can have such different weather.... I set off in the dark of course, it was misty and dreek towards Ramsey, I needed lights on still at 10am due to thick sea mist in Bride, it was sunny spells and really cold in Peel, but after the Sloc, the decent into Ballabeg saw a cloudless sky for the rest of the ride and at least 3 degrees warmer! A grand day by all accounts. Posted by Mary on January 23rd, 2010. Looks fabulous Mary, not at all like the weather here in dreich East Kilbride. I must add IoM to my holiday shortlist. I've not been out on the bike for 2-3 weeks having been away on business. Unfortunately it isn't easy to take my bike with me, which is a shame because I've visited some nice areas of the country recently. Still, might get out tomorrow afternoon if I finish all my chores! Lovely photos from the Isle of Man, as usual. I know very little about Audax. How do people find out about 'Celts, Trams and Castles' I wonder? When I searched Google for Audax Celts, Trams and Castles the first page listed was Celts Trams and Castles on the CTC website, added by 'snook'. The route map is available but I've forgotten my CTC membership number to login to view it. Next question: how can I find out my CTC membership number? Yes, great photos again, Mary. So is your Celts, Trams and Castles Audax run, say, once a year officially and you just happen to ride it whenever you want? Or does it count towards your Audax points each time you do it? Patrick, I am a member of CTC as well. But I have never used my membership number to login. I assume you need to contact the CTC themselves and they will email it to you, but this is a guess. Scroll down all the permanent routes, they are listed under the organisers name. My name starts with W, so you will find the route there listed as Celts, Trams and Castles. Click on that for more details. I expect my route has been added by 'snook' on the CTC website (havent seen it myself but Ive not looked yet), as it was Steve Snook from Audax Uk who verified the route as hilly enough to have AAA points on it. Chris, the route is classified as a 'Perm' this means its a permanent route not an organised event, you have to be self-guided, and self sufficient. It means it can be run at anytime, by any number of riders, from 1+. As I organised it myself (selfishy cos there were no Audax rides where I live.....), I can sort out my own dates whenever I am ready to do it. As a rider, I have to fill in my Brevet Card, and collect cash-point receipts to prove passage, date and time once the ride is complete, I send off the Brevet card to Audax uk for verification by John Ward of Audax UK. As the route has been verified as having 1650m of climbing it has AAA points and these count towards the AAA Challenge – ie one Audax ride with AAA points per calendar month. This particular ride is worth 1.75 AAA points. I searched google.co.uk for audax route isle of man and found the page we're on now. Great! I haven't found the actual route on a map though. You could plot the route on bikely and export it as a file that people can download from here and put on their GPS to follow when they cycle it, or even fly along it in a virtual plane on Google Earth in 3D. If I knew the route map I'd be happy to do that myself – the bikely thing. Lovely article and photos Mary. And well done with the organisation. A tip for long spins. Keep your pulse below a certain amount when you're climbing. We're all inclinded to climb too fast and then we get tired! Wonderful photographs, and a good account of your Audax organising. In only 2 years or so, you've gone from strength to strength. Well done.